Have you been advised to thicken all your liquids to prevent liquids getting down the wrong way into your lungs? Hopefully, you have had a comprehensive evaluation by a swallowing specialist. Read more about thickened liquids. I cannot recommend one brand over another. Ongoing work by the International Dysphagia Diet Standardisation Initiative (www.iddsi.org) will hopefully help industry to continue advancements. This will make thickened liquids more palatable, more standardized and safer for people who need them. According to the best evidence we have to date, thickeners with gums, like xanthan gum, are the most stable in the mouth, through the throat, and in response to changing temperatures. See list of some of the gum-based thickeners at the end of this review. There are some major issues with thickeners that are made with modified corn-starch or modified food starch (tapioca and corn). These come in powder form and in pre-thickened liquid form. Examples of modified corn and food-starch thickener products are: Resource ThickenUp, Hormel Thick & Easy, Hormel Thick & Easy Thickened Dairy, and Thick-it Instant Food & Beverage thickener. Why should I be concerned about starch-based thickeners? There has been a lot of variability in the thickness across these companies with these starch-based thickeners, even when testing the pre-thickened liquids right out of the container. Recently, per liquid flow tests, IDDSI found that Hormel’s Thick & Easy Thickened Dairy / Nectar Consistency (Mildly Thick), was actually measuring on flow tests at a honey thick level (Moderately Thick). When a pre-thickened liquid out of the container appears too thick, that will immediately affect the visual appeal. Thickening with starch-based thickeners also tends to make the liquid appear cloudy. Therefore, water does not look like water. Starch thickeners affect the taste and give the mouth a gritty feeling. When sampling corn-starch based powdered thickeners versus gum-based powdered thickeners, I was struck by how you could feel the little particles in the water with the corn-starch based thickener. The gum-based thickeners all felt smooth in my mouth and did not change the taste of the water. Hormel, Resource and Thick-It now all make a “clear” version, which uses the xanthan gum and other gums. See list at the bottom of this review of some of the companies that make “clear” thickeners. These are both water! See the cloudy starch-based thickener on the left. A clearer gum-based thickener on the right. 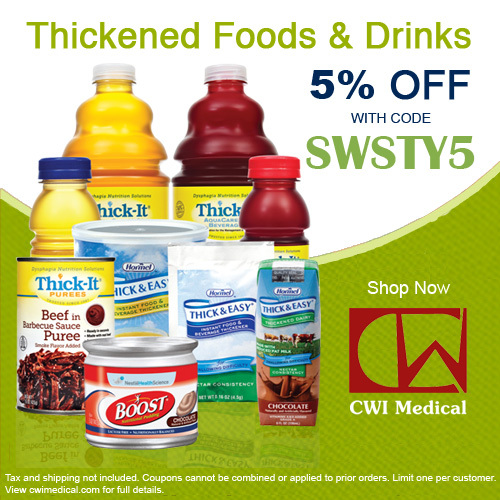 NO thickener company has provided products at truly consistent viscosity ranges yet, per Dr Catriona Steele, PhD, CCC-SLP, BCS-S, ASHA Fellow and member of www.IDDSI.org (International Dysphagia Diet Standardisation Initiative). This lack of standardization really poses patient safety issues. READ MORE on my previous blog on Diet Safety. Steele described how xanthan gum thickeners may be more stable, as you avoid the issue of enzymes in your saliva that cause a breakdown in the starch-based thickeners. Research has showed how this enzyme, salivary amylase, dramatically reduces the thickness of the liquid you are drinking when thickened with starch-based thickeners. Therefore, the thickened liquid prescribed to you by your Speech-Language Pathologist and doctor, based on a swallow study, may not be consistent with what you are drinking. In other words, your mildly thick/nectar thick liquid may thin down to a regular-thin liquid as saliva contaminates the cup. This could cause the liquid to get down the wrong way into your lungs. What if you are still aspirating your thickened liquids? If thickened liquids are still aspirated, it may be harmful to the lungs. The lungs have a harder time clearing a very thick liquid (moderately thick/honey thick) out of the lungs. Make sure you are on the right level of thickness. If you are prescribed a nectar thick liquid (aka, mildly thick per IDDSI), make sure that it is not given to you at a honey thick or pudding thick level (aka, moderately thick or extremely thick liquid). If the spoon stands up in it, it is likely a honey thick (moderately thick) liquid. If it plops off the spoon or sticks to the spoon, it is likely a pudding thick (extremely thick) liquid or even mud!! Thicker is not always better or safer. It could cause increased residue in your throat, which could spill into your airway after the swallow. Please have your swallowing specialist (Speech-Language Pathologist who specializing in swallowing) perform a comprehensive evaluation of your swallowing. Also, if the mouth is full of bad bacteria, a corn-starch based thickening agent in your liquid may bind with your saliva, carrying the bad bacteria to the lungs along with the liquid. 1. Please read the ingredients on all labels. Many of these pre-thickened liquid milk and juice boxes have added sugar. The Hormel Thick & Easy Dairy dropped its sugar down to 15 grams for Nectar Thick (mildly thick) and 16 grams for Honey Thick (moderately thick). It used to be higher. The old Hormel Thick & Easy Hydrolyte Water with modified corn starch had high fructose corn syrup added. However, now the Thick & Easy CLEAR Hydrolyte has 0 grams of sugar and only lemon flavor, citric acid and sucralose added. Thick-It AquaCare H20 brand with xanthan gum still has 36 grams of sugar in the cranberry juice, whereas Thick & Easy Clear Cran Juice has 23 grams. Check for artificial flavors and colors if that is important to you. The Thick-it AquaCare H20 Cranberry has Red 40, artificial flavors and carmel color added. Thick & Easy Clear Cran Juice also has artificial flavor, Red 40 and Blue 1. If sugars and added ingredients are of concern, and you want the convenience of a pre-thickened liquid, you will have to buy just the waters or Thick-It has a regular and decaffeinated coffee with 0 grams of sugar. Otherwise, if you have your preferred beverage that is low in sugar, you will have to use the gum-based powders or gels to create a the thickened liquid yourself. Can Infants clear the thick liquid out of the airway if they aspirate a thick liquid? How does it affect an infant’s brain development? Neuroplasticity. If we teach an infant the swallowing physiology needed to swallow a thick substance, than how will they develop the ability to swallow a faster moving liquid. Will an infant’s immature digestive system absorb and process the thickener to make the fluid fully “bioavailable” to the body for adequate hydration? Even SimplyThick, a xanthan gum fully-hydrated gel product, caused an adverse reaction in an infant due to bacterial contamination at the manufacturing plant. SimplyThick (Water-soluble gum in a fully-hydrated solution form. Per the company materials and FDA findings in 1993, fully-hydrated solutions do NOT cause risk of powder particles swelling to cause asphyxiation or esophageal obstruction. Whereas, undissolved/unhydrated gum powder thickeners could cause a blockage if not properly mixed). However, SimplyThick is a bit harder to mix if you do not have a sealed container to shake it up. SimplyThick does not recommend mixing with a spoon. You have to either shake vigorously or mix briskly with a fork in an “egg-beating” fashion for 20-30 seconds.